Honestly I've never been one for a matte lip, for some reason I got it into my head that my lips simply weren't plump enough to pull it off (I personally blame instagram and Kylie Jenner) or that they dry out your lips something awful, something I do not need, and until today have stuck mainly to creme lips and sheer butter balms, you know... the safe bets. But recently I have discovered a game changer and I want to introduce you to said beauty balm which has came into my life and altered all previous perceptions of plump lips and matte mishaps, ladies and gentleman I introduce Revlon's Colourburst Matte Balm in Sultry! Now these have been around for a while now, you will undoubtedly be familiar with the Emma Stone advert with all of the lovely matte and sheen balloons, or perhaps you've seen bloggers raving and reviewing these like mad throughout the past few months (admittedly I am late on the bandwagon) but if I'm honest this is really more about me getting over my fear of the matte! Revlon boast a triple butter complex, meaning they are not only colourful and highly pigmented but they have moisturizing qualities too, which with our wintery weather in Scotland recently has been a godsend, so after hearing this I was incredibly keen on giving it a go. The shade which I chose to experiment with, which is called Sultry, was actually inspired by a fellow beauty / lifestyle blogger I came across on Twitter (and I apologise to the lovely lady whose name and blog name escape me!) and I instantly fell in love with the shade. It is a brown - pink shade which I think has a very vintage appearance when applied and can be absolutely stunning if styled well. One of the first things I noticed was the scent, which sounds odd but upon looking into the forumla further I discovered that it has a light peppermint fragrance, which also explains the cooling sensation I experienced after reapplying later on in the day! I was really interested to see whether or not these would last throughout the entire work day, because I had heard mixed reviews where this was concerned, but I am pleased to report that I have had no issues whatsoever and it only required one very small top up while I was at work. 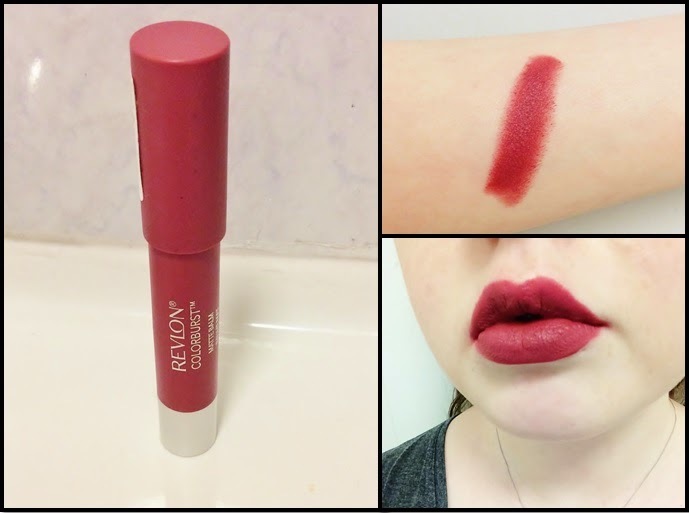 In short if, like me, you're looking to experiment with a matte formula which looks great, doesn't dry out your lips, has longevity, is highly pigmented, easy to throw in your handbag and as a bonus smells lovely then Revlon are your guys! Do let me know how you've found these or maybe if you've found something similar to this forumla, I would love to know in the comments below, on Twitter or of course if you'd just like to see more from me, my face and I be sure to hop over to Bloglovin. Until next time, I'll be with my matte made in heaven. Ooooo what a gorgeous shade, love this! One of my faves of the moment, I think it is a good transition from all of the warm Wintery reds we have been seeing of late.